On the back cover of Larry Tye's new book, "Superman (The High Flying History of America's Most Enduring Hero)" five words of praise from five praise-worthy fans of Superman. I will share three of them... and then, in the days to come, add my own thoughts, chapter by chapter. Al Roker says: "For al those who ever pluncked down twelve cents for a 'Superman' or 'Action' comic, or watched Geroge Reeves jump on that springboard in 'Adventures of Superman,' this book is for you. It is the definitive story of the greatest superhero in all his incarnations and iterations. Look, up in the sky... it's a terrific read!" Noel Neill: "When I first played Lois Lane, on the big screen in 1948 with Kirk Alyn, and later on television in 1953 with George Reeves, none of us really knew what we were dealing with. None of us truly understood we were making history and contributing to a legacy that has lasted so long. Larry Tye's 'Superman' is the book I wish I had written years ago." Jack Larson: "Extraordinarily researched and fascinating... This book makes all of the facts and events plain, and I understand it all for the first time." Chapter 2 - "A Hero For His Times" Dononfeld and Liebowitz printed 202,000 copies of Action #1. In those days, publishers figured sales that exceeded 50% of the print run was good. Sales of Action #1, with Superman on the cover, reached an outstanding 64%! And in subsequent months, print run and sales figures only continued to rise. In "A Hero For His Times" Tye reports not only the numbers, but the reasons behind the high figures. The world was changing in the late 30s and early 40s, and the publishers were anxious to feed America's need for inexpensive and exciting entertainment. This era was also a time of growth as Superman took on new and different challenges for the times. The early 40s was also a time of struggle between the creators and the publishers... and that story is as exciting as any of Superman's adventures. The stories Jerry Siegel wrote now had to be approved by New York, and more and more, editors such as Whitney Ellsworth were calling the shots. This chapter tells not only of those internal struggles but of the attacks from without as other companies attempted to match Superman's success. Donenfeld would have none of that. Whenever Donenfeld's name comes up I think of the story Jack Larson told years ago when Donenfeld visited the set of the "Adventures of Superman." Jack remarked to George that Donenfeld was shorter than he thought he'd be. George's reply, "Well... not when he stands on his money." Chapter 3 - "A Matter Of Faith" Every time a movie is released, a book published, a painting unveiled, or a song song, people attempt to find meaning behind those works of art. In some cases, I suppose, such as Carly Simon's "You're So Vain," the works are worth exploring. In the case of Superman, I'm not so sure. Nevertheless, that doesn't prevent people from discussing it. In "A Matter of Faith" Larry Tye examines some of the frequently supposed religious overtones attributed to the Superman mythos. Sometimes a banana is just a banana, and perhaps Jor-El, as Jerry Siegel insists, is simply an amalgam of "Jerome" and "Siegel." Interestingly those from almost all faiths see their beliefs supported in Superman. And just how is an interesting story. With that said, Tye goes on to ask the question "Can a comic book character actually move readers to change their behavior and lift their horizons?" The answer was not surprising to me. Chapter 4 - "The Speed Of Sound" Superman + Radio + Robert Maxwell = New opportunities for Superman, Inc. and trouble for the KKK. Radio was a powerful medium in the 1940s, and Robert Maxwell took full advantage of it. It was during these years that Superman's back story was changed yet again, and new powers (flying) and characters (Jimmy Olsen, Inspector Henderson) added to the Superman saga. And just as the comic book Superman knocked out most of its literary competition, so too the radio Superman rose high and reigned supreme in "radioland" soon after Maxwell put his show on the air. In the 1940s, it seemed people all over the world knew Superman... and loved his exploits. That is, perhaps, with the exception of Adolf Hitler. And yet it seemed Superman was even too big for just comic books and radio... so soon the giant screen lit up with his exploits... with a novel thrown in the mix that yet again changed Superman's history and provided the backdrop for the TV series that would come in the following decade. Then, coming full circle... Superboy was added to DC's stable of characters. The 1940s were a fabulous time for the Man of Steel and the creative team behind him... and Tye tells the story well. Chapter 5 - "Superman, Inc." With Superman becoming more and more popular in almost all media, it was time to get down to business, and Superman, Inc. was created as his merchandising arm. This chapter details the many fingers at the end of that arm: Buttons, peanut butter, pajamas, bread, lollypops, chocolate bars, suspenders, bubble gum, squirt guns, lunch boxes, underpants, and on and on. "Superman, Inc." also gets into the business of Jerry Siegel's ever-growing disputes with Donenfeld and Liebowitz and the suit he filed against them which resulted in the affirmation of DC's ownership and the loss of Jerry and Joe's jobs. There was also the matter of the disintegration of Jerry's marriage and his being reunited with Joanne Carter, the model who first posed for Lois Lane. Chapter 6 - "The Deadly Truth" Even as National Comics' merchandising arm saw blue skies, there were dark clouds looming. And those clouds bore the not the image of Brockhurt, but of Fredric Wertham who proclaimed that comic books, including Batman, Wonder Woman, and Superman, were "an invitation to illiteracy" and encouraged "criminal or sexually abnormal ideas." In this chapter Larry Tye tells of the many campaigns cities and states launched to counter the popularity of comic books. And there were indeed many. Yet the controversy and constant barrage of criticism stopped National from moving forward and embracing a new medium, one itself that would soon face the same harsh criticism as comic books. This portion of the book is, of course, my favorite for it reviews the early days of the the television. Tye takes us through the search for a Superman and additional cast and on through "Superman And The Mole Men" and the first season. And after "Adventures of Superman" finally aired (with a few concessions to Kellogg's), the show was deemed a success in the press and with television viewers. I found one particular statement from Tye, describing the TV Superman, especially satisfying to me: "Today, when those now grown-up fans call to mind their carefree youth, they think of his TV "Adventures of Superman," and when they envision Superman himself, it is George Reeves they see." I could not agree more. Tye continues the chapter by describing Maxwell's exit and the rise of Whitney Ellsworth, along with the changes he made to the series. And with the advent of the Comics Code, the "Adventures of Superman" helped to turn the tide against Wertham's rants. Superman onced again triumphed. The chapter concludes, however, with a very heart-breaking event... an event, that for those of my generation, brought an abrupt and tragic conclusion to a most enjoyable and memorable era. Chapter 7 - "Imagine This" The 1960s opened the era of Superman's many "imaginary stories" when, in 1957, Mort Weisinger rose in the ranks and Jerry Siegel was back as a freelancer. Weisinger brought about many changes, but not always delicately. He fired Wayne Boring in a most indelicate manner and often lied to the people working for him. But Weisinger was a master at his craft, and this chapter includes an interesting anecdote about a debate between Weisinger and one Fredric Wertham. And it was during Weisinger's tenure that the Superman universe expanded to include Bizarro, Beppo, Titano, Comet, Streaky, and many others. Many varieties of kryptonite were added. This chapter also details how Superman found his way to Broadway... and why he stayed for only a short while. But after that, several new cartoon series ("The New Adventures of Superman," "The Superman/Aquaman Hour of Adventure," and "The Batman/Superman Hour") appeared on the home screen. And whereas just a few years prior, Superman was accused of fostering illiteracy, he later became a champion of government campaigns for fitness and literacy. The chapter concludes with the story of Harry Donenfeld's inglorious exit, another legal suit from Jerry and Joe, and the eventual sale of DC to Kinney National Services who later bought the Warner Bros. Studio, and the end to Weisinger's tenure... along with the end of an era." Chapter 8 - "Believing A Man Can Fly" The seventies were also a time of change for Superman in the comic books. With Mort Weisinger out and Julie Schwartz in, Superman became more vulnerable and introspective. Kryptonite was gone, but there were new nemeses, and Superman was not quite as super as he had previously been. Clark moved to Galaxy Broadcasting; Superman became more involved in politics. But all that was short lived with the arrival of Jenette Kahn, a young woman who revitalized the stories and merchandising and brought greater dignity to the creative team at DC... all in an effort to better compete with a real nemesis, Marvel. For better or worse, the seventies surely weren't the fifties, and the making of "Superman: The Movie" was far different from the making of "Superman And The Mole-Men." This chapter tells the story of Alexander Salkind's vision, and... production style. Whereas "Superman And The Mole-Men" required a few months and a few thousand dollars, "Superman: The Movie" required years, millions of dollars, and three shooting locations. Many pages are devoted to the Salkinds, director Richard Donner, and to the big screen's newest Superman, Christopher Reeve. And with this new team, according to Tye, came yet another change. "Christopher's Superman would be funnier and more human -- if less powerful or intimidating -- than any who had preceded him. He was more of a Big Blue Boy Scout now, in contrast to Kirk Alyn's Action Ace and George Reeves's Man of Steel." Chapter 9 - "Back To The Future" I had been a Superman fan since I first saw George on the small screen in 1953, and that b&w image suited me just fine... as did the fifty-two episodes that began airing in color in 1965. I embrace *some* change... but Superman could have stayed as I first found him forever. Nevertheless, DC had other and more diversified folks to think about, and they wasted no time in doing that. In order to explain some of Superman's contradictory history, the idea of alternate realities were concocted. Earth-1, Earth-2, Earth-3, etc. There could be as many as needed. It all became so mind-boggling. Then boom: Crisis on Infinite Earths and soon John Byrne's reboot. According to DC's bank account, Byrne's vision (along with a corresponding transition of comics books racks in candy and grocery stores to specialty shops) paid off. This chapter also reviews the sequels to "Superman: The Movie" and the Salkinds' move to the small screen with "Superboy." For those of you (like me) who stopped reading comics long before the 1980s, the trip through this decade is a confusing one. But Tye manages to make some sense of it... even to me. It's an interesting journey, to be sure. Chapter 10 - "Till Death us Do Part" Superman's life was really shaken up in the 1990s. Actually, Doomsday did more than shake up Superman's life, and Superman #75 racked up the biggest one-day sale for a comic book. In the months that followed Superman's death, Metropolis became home to four would-be replacements... with each story line appearing in a different DC title: "Superman," "Adventures of Superman," "Action," and "Superman: Man Of Steel." Things were looking pretty good in Superman's comic book world. And then there was the television series, "Lois & Clark: The New Adventures of Superman," that ran for four season. During it's third season, the comic book stories and the television scripts melded in marriage. Tye goes on to decribe yet another comic book series (later in the decade) called "Kingdom Come" and the reasoning behind it. Even as the citizens of Metropolis are frequently given cause to think of what their lives would be like without Superman, so too do citizens of the real world often reflect on his personal influence. Larry Tye relates what Superman means to Henry Louis Gates, Jr., Al Roker, and Shaquille O'Neal. Also mentioned are folks like Bill Necessary from Texas, Bill Cholette from Massachusetts, and (TAC reader) Donald Wurzelbacher from Ohio. The chapter ends with brief descriptions of the last days of some of those very close to Superman: Joe Shuster, Jerry Siegel, Joanne Siegel, Jack Liebowitz, Christopher Reeve, and Alexander Salkind. 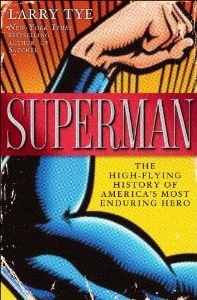 Chapter 11 - "Tights And Fights" In "Superman (The High-flying History of American's Most Enduring Hero)," Larry Tye has taken us on a far journey... a journey that took us into the past... where many years ago the idea of a Superman burned in the minds of two Cleveland teens. And in this concluding chapter, Tye brings us up to the present... and Superman's presence in the twenty-first century. First is an analysis of "Smallville" (whose debut episode brought the biggest audience ever for a WB initital offering)... then an account of Bryan Singer's "Superman Returns" and how he had to coordinate his efforts with those of the producers of "Smallville." And then there is the ongoing lawsuit brought against DC by the Siegel heirs... a complicated process that so far has involved seven different federal judges... with the possibility of another one by Joe Shuster's nephew. And as all this plays out, the writers and artists of Superman continue to explore and imagine with story arcs like "Superman: Red Sun" (in which we see what might have happened if Kal-El's rocket had landed in the Ukraine instead of the American mid-west) and "Superman: Birthright," and a new comic book called "Superman/Batman." And in 2011 DC restarted their entire series. Tye ends the chapter on an upbeat note by reviewing Superman's prominent role in American culture and his continuing presence in today's multi-media world and hopefully... one that will extend far into the future.